Here are a few tips that seem perfectly logical when we are out in the field but we often forget when we’re still at home (and this happens more often than you would like to think). Get Google Earth images of the places you plan to visit. Sure, maps are nice but they are often at the wrong scale for the areas you need. Plus which, maps tend to emphasize man-made features and for birdwatching, the natural features are just as important. Use Google Earth to find your sites and, if the resolution of the imagery is good for that location, print a few color copies of those (and surrounding) areas. It doesn’t take very long to learn how to equate the color and texture of the image with what is on the ground, and it could be a real benefit when deciding which routes to take and which areas to check once you’re out there. This may not seem important at the start of the trip but the value of always having some bug repellant on hand becomes apparent when trying to hold you’re your binoculars still amidst clouds of mosquitos or biting flies. Plan your walk with the sun behind you, thus making it easier to see the birds. This seems too implistic to even mention but it really does make a difference to have the sun at a ‘viewer friendly’ angle. Plus which, this will help you avoid getting too carried away when the bird you are watching takes flight and you track it with your binoculars, right across the sun. Believe me, a flash of direct sunlight through the binoculars can be a painful thing. It also messes up your ability to see clearly for quite a while. Stop walking every once in a while and just listen. Some bird species are never seen by novice birdwatchers simply because the birds are high in the tree canopy and their song is very faint. The phrase ‘follow the sounds’ may not mean much to regular folk but it means a great deal to birdwatchers. Sit and let the birds come to you. This is another way to find birds that you might otherwise miss. Some bird species are very elusive, either because they are well camouflaged, very quiet or highly sensitive to animals (namely, you) moving through their environment. For example, the tiny Brown Creeper forages for insects hidden beneath flakes of tree bark on spruce and pine trees. The bird’s variegated brown and grey plumage is perfectly suited to blend in with the tree bark, so it’s quite possible to pass right by a tree with one of these birds on the trunk at eye level and never notice it. But if you sit and watch, its quick movements along the trunk will give it away. Some bird species don’t like to come out into the open, even if you are pishing like mad. Their best protection from potential predators is to remain within the tangled branches of shrubs and undergrowth. So if you want to see them, it’s best to crawl along the ground, find a comfortable spot and wait for them. This is a variation of the previous tip, only closer to the earth. Pishing works remarkably well to draw out many species, especially the songbirds. But if your lips are tired, or it’s cold outside and your lips are half-frozen, pishing isn’t much fun. That’s when you should use an Audubon Bird Call. These are small (2 inches long) hollow cylinders of birchwood in which a stem of metal, usually pewter, is inserted. By holding the cylinder and lightly rotating the pewter stem, the device makes a wide variety of squeaking, whistling and chipping sounds. They are great for enticing songbirds to come a little closer, providing you with better views of those birds who always seem to be on the other side of the tree. 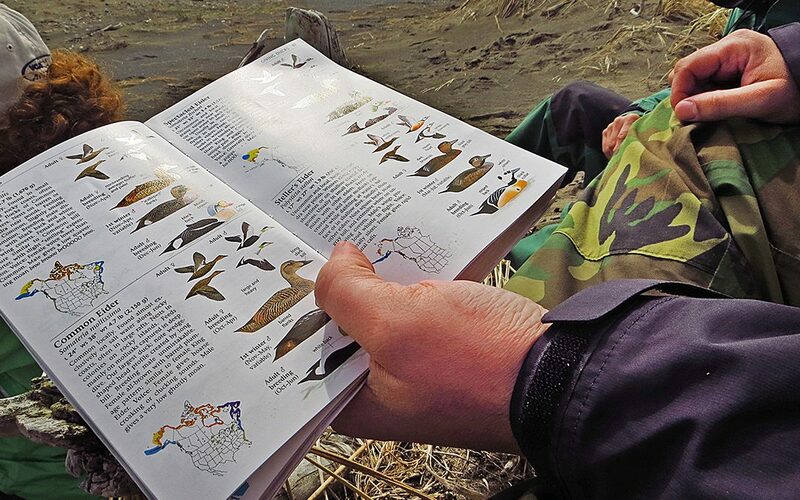 Most nature stores will carry these Audubon Bird Calls. A cap for the eyepieces of your binoculars may be a pain to put on and remove every time you want to use the binoculars, but they more than make up for the inconvenience when it’s raining or there is a lot of dust swirling around. Plus which, they help protect the optics of your binoculars, a significant issue given the cost of good quality binoculars.